Zone 3. Native to eastern U.S.
Mixed beds. back drop. cutting. Good choice for situations where lupines fail. 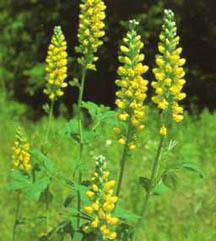 Also called False Lupine. Easy and long lived. Takes a few years to reach full stature. Plants can be cut back after flowering if foliage deteriorates. Division not recommended.